In this series we are covering projects that explore what is possible when the web becomes decentralized or distributed. These projects aren’t affiliated with Mozilla, and some of them rewrite the rules of how we think about a web browser. What they have in common: These projects are open source, and open for participation, and share Mozilla’s mission to keep the web open and accessible for all. We’re a team of people all over the world working on IPFS, an implementation of the distributed web that seeks to replace HTTP with a new protocol that is powered by individuals on the internet. The goal of IPFS is to “re-decentralize” the web by replacing the location-oriented HTTP with a content-oriented protocol that does not require trust of third parties. This allows for websites and web apps to be “served” by any computer on the internet with IPFS support, without requiring servers to be run by the original content creator. IPFS and the distributed web unmoor information from physical location and singular distribution, ultimately creating a more affordable, equal, available, faster, and less censorable web. IPFS aims for a “distributed” or “logically decentralized” design. 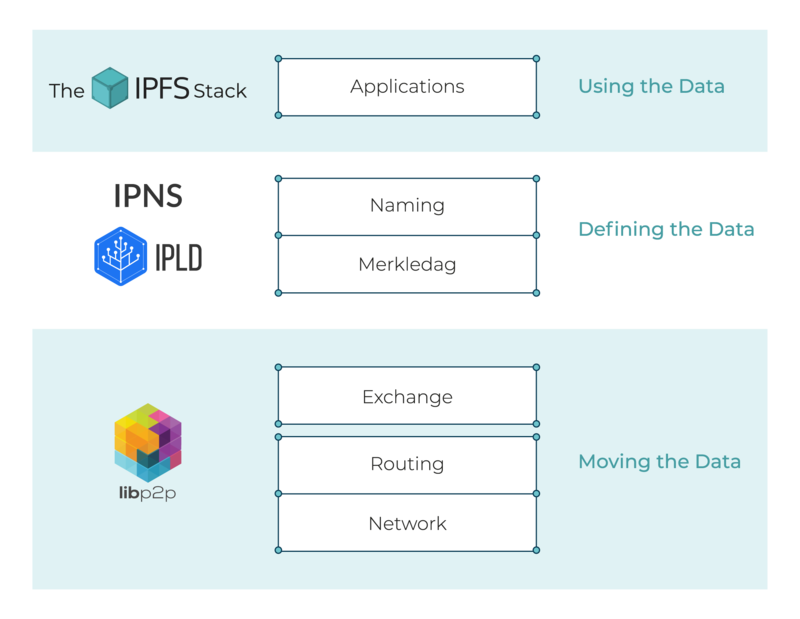 IPFS consists of a network of nodes, which help each other find data using a content hash via a Distributed Hash Table (DHT). The result is that all nodes help find and serve web sites, and even if the original provider of the site goes down, you can still load it as long as one other computer in the network has a copy of it. The web becomes empowered by individuals, rather than depending on the large organizations that can afford to build large content delivery networks and serve a lot of traffic. Who else can access it? Everyone with the CID can access it. Sensitive files should be encrypted before publishing. How long will this content exist? Under what circumstances will it go away? How does one remove it? The permanence of content-addressed data in IPFS is intrinsically bound to the active participation of peers interested in providing it to others. It is impossible to remove data from other peers but if no peer is keeping it alive, it will be “forgotten” by the swarm. The public HTTP gateway will keep the data available for a few hours — if you want to ensure long term availability make sure to pin important data at nodes you control. Try IPFS Cluster: a stand-alone application and a CLI client to allocate, replicate and track pins across a cluster of IPFS daemons. You can experiment with js-ipfs to make simple browser apps. If you want to run an IPFS server you can install go-ipfs, or run a cluster, as we mentioned above. There is a growing list of examples, and make sure to see the bi-directional file exchange demo built with js-ipfs. You can add IPFS to the browser by installing the IPFS Companion extension for Firefox. Learn about IPFS concepts by visiting our documentation website at https://docs.ipfs.io. Readers can participate by improving documentation, visiting https://ipfs.io, developing distributed web apps and sites with IPFS, and exploring and contributing to our git repos and various things built by the community. A great place to ask questions is our friendly community forum: https://discuss.ipfs.io. We also have an IRC channel, #ipfs on Freenode (or #freenode_#ipfs:matrix.org on Matrix). Join us! The post Dweb: Building Cooperation and Trust into the Web with IPFS appeared first on Mozilla Hacks - the Web developer blog. 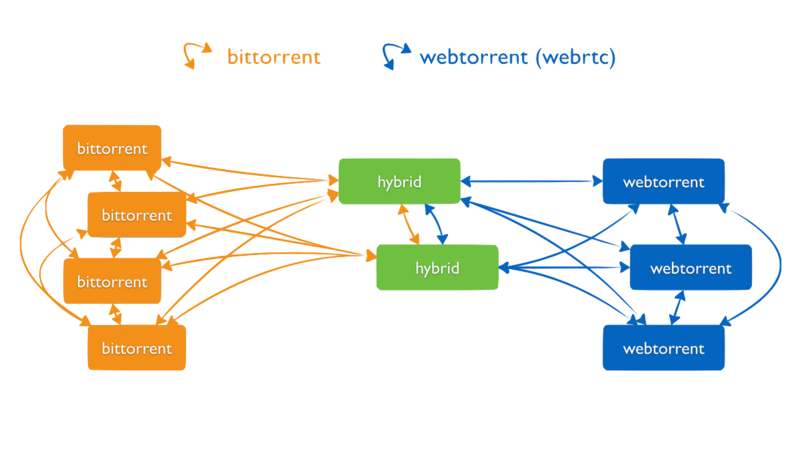 Using open web standards, WebTorrent connects website users together to form a distributed, decentralized browser-to-browser network for efficient file transfer. The more people use a WebTorrent-powered website, the faster and more resilient it becomes. The WebTorrent protocol works just like BitTorrent protocol, except it uses WebRTC instead of TCP or uTP as the transport protocol. In order to support WebRTC’s connection model, we made a few changes to the tracker protocol. Therefore, a browser-based WebTorrent client or “web peer” can only connect to other clients that support WebTorrent/WebRTC. Once peers are connected, the wire protocol used to communicate is exactly the same as in normal BitTorrent. This should make it easy for existing popular torrent clients like Transmission, and uTorrent to add support for WebTorrent. Vuze already has support for WebTorrent! It only takes a few lines of code to download a torrent in the browser! To start using WebTorrent, simply include the webtorrent.min.js script on your page. You can download the script from the WebTorrent website or link to the CDN copy. That’s it! Now you’ll see the torrent streaming into a <video width="300" height="150"> tag in the webpage! You can learn more at webtorrent.io, or by asking a question in #webtorrent on Freenode IRC or on Gitter. We’re looking for more people who can answer questions and help people with issues on the GitHub issue tracker. If you’re a friendly, helpful person and want an excuse to dig deeper into the torrent protocol or WebRTC, then this is your chance! The post Dweb: Building a Resilient Web with WebTorrent appeared first on Mozilla Hacks - the Web developer blog. In the series introduction, we highlighted the importance of putting people in control their social interactions online, instead of allowing for-profit companies be the arbiters of hate speech or harassment. Our first installment in the Dweb series introduces Secure Scuttlebutt, which envisions a world where users are in full control of their communities online. In the weeks ahead we will cover a variety of projects that represent explorations of the decentralized/distributed space. These projects aren’t affiliated with Mozilla, and some of them rewrite the rules of how we think about a web browser. What they have in common: These projects are open source, and open for participation, and share Mozilla’s mission to keep the web open and accessible for all. The central idea of the Secure Scuttlebutt (SSB) protocol is simple: your social account is just a cryptographic keypair (your identity) plus a log of messages (your feed) stored in a local database. So far, this has no relation to the Internet, it is just a local database where your posts are stored in an append-only sequence, and allows you to write status updates like you would with a personal diary. SSB becomes a social network when those local feeds are shared among computers through the internet or through local networks. The protocol supports peer-to-peer replication of feeds, so that you can have local (and full) copies of your friends’ feeds, and update them whenever you are online. One implementation of SSB, Scuttlebot, uses Node.js and allows UI applications to interact with the local database and the network stack. While SSB is being implemented in multiple languages (Go, Rust, C), its main implementation at the moment is the npm package scuttlebot and Electron desktop apps that use Scuttlebot. To build your own UI application from scratch, you can setup Scuttlebot plus a localhost HTTP server to render the UI in your browser. $(npm bin)/sbot publish --type post --text "Hello world"
owned by friends in the community, which act as mirrors of feeds in the community. Using an invite code means the server will allow you to connect to it and will mirror your data too. SSB applications can accomplish more than social messaging. Secure Scuttlebutt is being used for Git collaboration, chess games, and managing online gatherings. You build your own applications on top of SSB by creating or using plug-ins for specialized APIs or different ways of querying the database. See secret-stack for details on how to build custom plugins. See flumedb for details on how to create custom indexes in the database. Also there are many useful repositories in our GitHub org. To learn about the protocol that all of the implementations use, see the protocol guide, which explains the cryptographic primitives used, and data formats agreed on. Finally, don’t miss the frontpage Scuttlebutt.nz, which explains the design decisions and principles we value. We highlight the important role that humans have in internet communities, which should not be delegated to computers. The post Dweb: Social Feeds with Secure Scuttlebutt appeared first on Mozilla Hacks - the Web developer blog. The web is the most successful programming platform in history, resulting in the largest open and accessible collection of human knowledge ever created. So yeah, it’s pretty great. But there are a set of common problems that the web is not able to address. Had a website or app you love get updated to a new version, and you wished to go back to the old version? Tried to share a file between your phone and laptop or tv or other device while not connected to the internet? And without using a cloud service? Gone to a website or service that you depend on, only to find it’s been shut down? Whether it got bought and enveloped by some internet giant, or has gone out of business, or whatever, it was critical for you and now it’s gone. These are some of the problems and use-cases addressed by a new wave of projects, products and platforms building on or with web technologies but with a twist: They’re using decentralized or distributed network architectures instead of the centralized networks we use now, in order to let the users control their online experience without intermediaries, whether government or corporate. This new structural approach gives rise to the idea of a ‘decentralized web’, often conveniently shortened to ‘dweb’. You can read a number of perspectives on centralization, and why it’s an important issue for us to tackle, in Mozilla’s Internet Health Report, released earlier this year. What’s the “D” in Dweb?! The “d” in “dweb” usually stands for either decentralized or distributed. In centralized systems, one entity has control over the participation of all other entities. 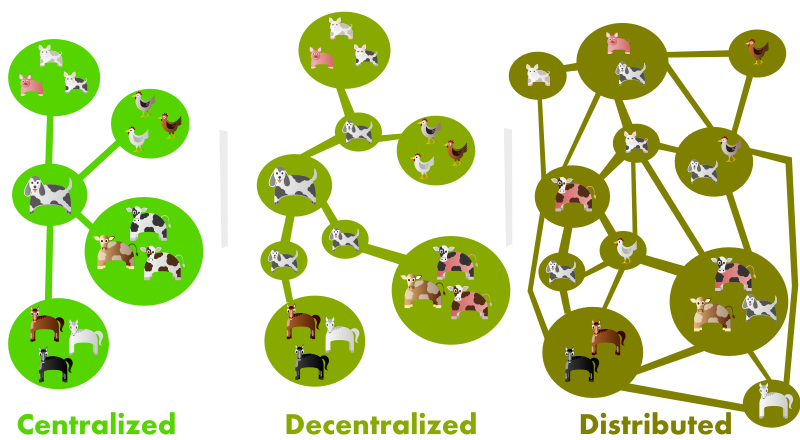 In decentralized systems, power over participation is divided between more than one entity. In distributed systems, no one entity has control over the participation of any other entity. Examples of centralization on the web today are the domain name system (DNS), servers run by a single company, and social networks designed for controlled communication. A few examples of decentralized or distributed projects that became household names are Napster, BitTorrent and Bitcoin. Mozilla’s mission is to put users in control of their experiences online. While some of these projects and technologies turn the familiar on its head (no servers! no DNS! no HTTP(S)! ), it’s important for us to explore their potential for empowerment. This is the first post in a series. We’ll introduce projects that cover social communication, online identity, file sharing, new economic models, as well as high-level application platforms. All of this work is either decentralized or distributed, minimizing or entirely removing centralized control. You’ll meet the people behind these projects, and learn about their values and goals, the technical architectures used, and see basic code examples of using the project or platform. So leave your assumptions at the door, and get ready to learn what a web more fully in users’ control could look like. Note: This post is the introduction. The following posts in the series are listed below. The post Introducing the Dweb appeared first on Mozilla Hacks - the Web developer blog.